Worshiping together is an opportunity for us to pray together, open our hearts, and tell God how truly grateful we are for His endless love and grace. We come together to hear the Word of God, share the Word with others, and understand that the Word is with us in our lives. God’s love is heard and shared at Trinity. Join us for worship this week. Please join us NEXT week at our worship services. Click here to view a weekly Bible Study to prepare for worship, watch videos of past services and view bulletins. Click here to watch the videos of recent worship services by visiting our YouTube channel. Childcare: While families with children are always welcome to worship together, trained attentive childcare is provided for children from birth through pre-school in the nursery adjacent to the sanctuary. Worship Activity Bags: Children who attend worship can visit the Activity Bag Hat Rack next to the sanctuary entrance, where they will find bags filled with worship-appropriate items to use during the service such as books, stuffed animals, coloring books and crayons. Kids Celebrate Bulletins are available from the ushers. Click here for a copy of this week’s children’s bulletin. An elevator is located in the narthex at the back of the sanctuary providing access to balcony seating and the fellowship hall located on the lower level. Large Print bulletins are available upon request from an usher. Impaired Hearing Loop: Hearing aids and cochlear implants with telecoils (T-coils) are able to experience sound enhancements in our sanctuary. There are no stairs at our two main building entrances on the south and west sides. Parking spaces for those with appropriate legal parking permits are available near our south entrance. Lutheran worship has four basic elements: GATHERING with fellow believers, hearing the WORD of God, sharing the MEAL of forgiveness, and then SENDING us out to serve God and our neighbors. Holy Communion is an integral part of worship. Also known as the Lord’s Supper, or the Meal, communion is the greatest expression of God’s love for His people. 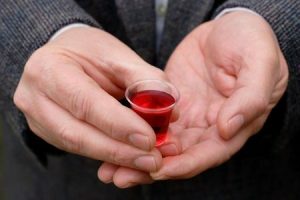 The bread and wine of communion represent Christ’s body and blood, shed for the forgiveness of our sins. Trinity offers communion at most worship services. All believers are welcome at The Lord’s table. At some worship services communion is at the altar rail. Please take a glass from the tray as you approach the altar. Full glasses have grape juice; empty glasses will be filled with wine. Ushers will direct you as we gather around the altar. You may kneel or stand. After receiving the bread and wine, return to your seat via a side aisle. At some worship services communion is by intinction, or dipping the bread in the cup. You will be given a wafer to dip into a chalice. The chalice has two sections, the larger section is wine and the smaller is grape juice. Gluten-free elements are always available upon request. We have many different worship opportunities happening here at Trinity Lutheran Church. We hope you can join us.